It is official. The Chinese yuan will be in the SDR. At a 10.4% share, it is a bit more than I expected, but less than the 14%-16% share that the IMF staff has intimated a few months ago. This is a significant event, even if there is no short-term market opportunity. The yuan’s exchange rate against the dollar has steadily declined over the month of November contrary to conspiracy theories that warned Chinese officials would devalue the yuan only after it joined the SDR. It is did not wait. Other conspiracy theorists note the long transition period before the new SDR basket is launched. What was announced 30 November 2015 will not be implemented until 1 October 2016. Much can happen before then. Some wonder if China faces a repeat of the market turmoil seen this past July-August, or worse, officials may backtrack on some of the very reforms that facilitated its ascension to the SDR in the first place. Being invited to join and then at the last minutes reneging would be the ultimate insult to the organization that has failed to reform and give some of the large developing economies, like China, a greater quota (weighted votes). That speculation is a bit over the top. China has been pressing to join the SDR. To refuse to join would be to shoot itself in the foot. It is true that many developing countries have been critical of the IMF for its actions in the 1997-1998 Asian Financial Crisis, and for what many perceive its relative leniency and over-commitment of resources to relatively high income countries in Europe. Joining the SDR is a sign of the rise of China, and the West’s recognition of this, more than an accelerant of the yuan’s internationalization. After all, the yen has been in the SDR since it was launched and yet the its international use remains quite limited, and as a reserve asset, it is quite minor. The SDR is a peculiar form of money. It does not circulate. It cannot be used to buy goods or services or financial assets. It is official money, and serves the function as a unit of account. It is also accepted as a means of payment for official-to-official transactions. It is not so much a store of value, and there are no bonds or stocks that trade denominated in SDRs. Some observers anticipate that with the yuan’s entry into the SDR that foreign central banks will quickly add the yuan to their reserves. We are less convinced. First, “can” and “will” should not be confused. Chinese officials have waived quota restrictions for foreign central banks and sovereign wealth funds, and still wide interest not materialized. Second, central banks typically move at glacial speeds, even at the best of times. Chinese markets are still not as transparent or as deep as the other SDR members. Chinese officials are expected to continue to take steps over coming months to liberalize its capital markets. Third, the current macroeconomic outlook is strongly colored by the divergence of monetary policies. The Federal Reserve is expected to raise rates in the middle of December and two to four times next year. Other central banks, including the PBOC, are still pursuing more accommodative stances. This means that to the extent market forces really do drive the yuan, the risk over the next year is for a weaker yuan. In addition there has been a significant rally in China’s bond market. Some investors have been chased out of the equity market by the volatility and/or the sharp rise in margin costs. The summer crash of equities has forced companies to turn to the bond market to raise capital. Wealth managers have created leveraged ways for high net worth individuals to participate. The lack of transparency, questions over credit quality at the sub-sovereign level, and opaqueness of the extent of Beijing’s obligations may already be discouraging foreign central banks from having much yuan in reserves. The IMF estimated a few months ago that only 1.1% of global reserves are in invested in yuan. This is well below the Australian and Canadian dollars, both of which, of course, are not in the SDR. Nevertheless, joining the SDR is a momentous occasion for China and the world. The closest comparison may be China’s entry into the WTO at the end of 2001. The conditions to join encouraged China to pursue a reform agenda and gave the domestic modernizers more gravitas. This is similar in spirit to the reforms that many European countries pursued to join EMU. 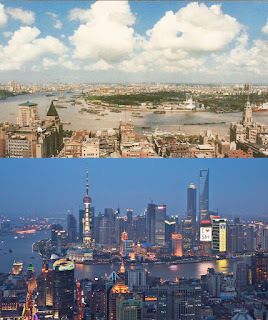 For eighteen of the past twenty centuries, China was the world’s largest economy. Imperialism and the early communist era (1949-1978) saw the country atrophy by numerous comparative economic measures. China is emerging from its dark era. Per capita GDP has grown eight-fold since 1978. The rise of China may be just as disruptive as the rise of the United States and Germany at the turn of the 20th century. As difficult as it may be, it is in everyone’s interest to learn from the mistakes of that earlier time and find ways to accommodate the old but newly rising power. China’s share of the SDR comes primarily at the expense of Europe (the euro and sterling). How fitting: The first part of the twenty first century is about building a Pacific Community that makes sense of the shift in the center of the world economy. For more than a quarter of a century now more goods have cross the Pacific than the Atlantic. China’s membership in the SDR is another step toward the new, less Euro-centric world.